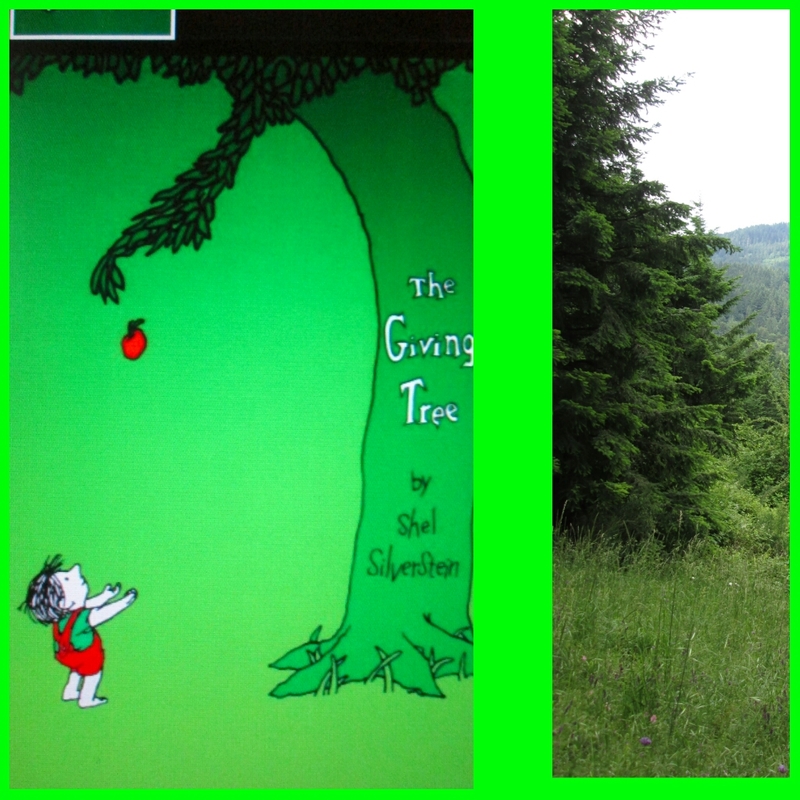 A children’s book I have loved since I read it to my daughter when she was a little girl more than 30 years ago is The Giving Tree by Shel Silverstein. I work with a program that reads to elementary school children once a week. I saw that book last week and grabbed it to read to the kindergarten girl who I read to every week. We loved it together. Yesterday (Friday) when I was looking up at the trees where I live while I was taking walk, and I thought- ALL TREES ARE GIVING TREES. All of our trees always give back to all of us humans because they put out oxygen in the atmosphere and take up the carbon dioxide we human breathe out and put out on this earth. Trees are the TRUE HEROES on this planet. Trees also give us fruit to eat, shade, and great beauty to look at. I personally love to live in places where there are a lot of trees. I need to see green every day. It helps to calm my hyper-mind, just looking out at trees. I feel happier when I live in a place where there are a lot of trees. In the past when we did NOT treasure our trees, many trees have been wiped out for centuries and have NOT grown back. Maine is a state in the USA where they kept cutting their trees. In the late 1600 and during the 1700s, the British cut most of the trees in Maine in order to construct ships when “Britannia ruled the waves”. There are still large swaths of land in Maine that still have almost NO trees. I have driven through one of those areas in Maine. The cutting of Maine’s trees was also one of the reasons that New Englanders were so against the British during the Revolutionary War for America’s freedom. You can read about this more in. Another state and area greatly affected by the removal of trees was in the Great Plains. The state of Oklahoma became what was known as the “Dust Bowl” beginning in 1931, and many farmers were forced to leave when they could not make a living. Removing trees and poor farming practices have been sighted as causes for this man made disaster in the middle states of the USA. This is a story about how drought in the USA may bring another kind of “Dust Bowl” back to those Great Plain states. Other ways that trees have given us humans resources are: PAPER, materials to build our shelter and homes, and even Rayon cloth comes from wood pulp. However, we have other sources that can replace trees as sources for paper and cloth- legal hemp known as industrial hemp! Hemp seeds and the oil from industrial hemp is healthy and great sources of protein. These days, I think, trees most important jobs are to feed us, give us shade, and to help clean up our air. When we can use industrial hemp to make cloth and PAPER, we would help save many of our trees. Industrial hemp has been used by humans for THOUSANDS OF YEARS. This is some more background. Certain states’ have phobias about industrial hemp that I find irrational. In about 2005 farmers in North Carolina were trying to make industrial hemp legal in that state, so that they could grow it instead of tobacco. Finally in October 2015 a bill was passed to legalize industrial hemp growth in the state. In 2014 there were only 11 states in the USA that allowed farmers to grow industrial hemp. Now there are about 30 states that have made growing industrial hemp legal. Our trees and nature itself are our REAL SUPER HERO on this planet. Being good stewards of trees and protecting them by using, for example, industrial hemp instead as sources of cloth, paper, and even building material, makes sense. We need to let trees stand, thin them as needed, because they continue to give back to every single citizen on this planet.